The US is on the rise -times are good. The interstate highway system is enacted creating miles orf smooth new roads for travel across the country, Elvis Presley releases his first hit and, with little notice, the worlds first computer language, FORTRAN, is released, paving the way for the technological revolution to come. Wear this distinctive gown to your wedding or prom and wow em. 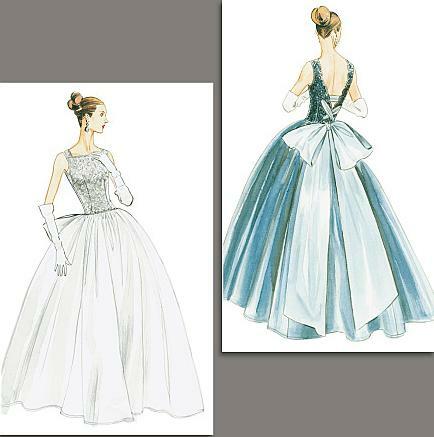 #N198 Close fitting bodice has squared neckline in front and v in the rear with bow insert. Lace over bodice. Full skirt.